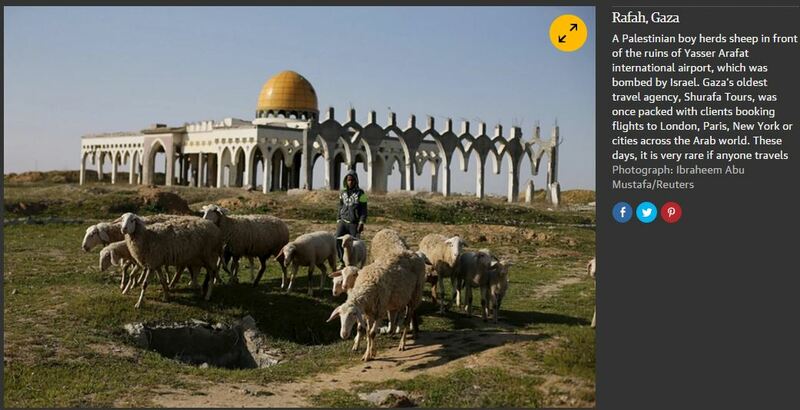 First, it would be difficult to find a photo more emblematic of the foreign media’s narrative of the Israeli-Palestinian Conflict: A context-free image of a Palestinian boy herding sheep amongst the ruins of a once thriving international transportation hub. Additionally, the caption is quite misleading. Despite the suggestion implicit in the text, the airport was actually “bombed by Israel”…over 13 years ago! A casual reader would be forgiven for believing that the bombing occurred quite recently. In fact, the original Reuters story (republished at Israeli outlets such as Ynet and Haaretz) which included the photo is clear that the airport was indeed bombed during the Second Intifada. One Guardian photo, a mere 53 words, and yet so misleading. The other thing about this is how the libero-fascists always carp their propaganda about how crowded Gaza is. You would think that there would be at least one other person within eyesight. Yes, I think that’s a demographically sound observation. I Googled your term libero-fascists and came away with nada. Maybe it’s because Liberals and Fascists are diametrically opposed? Sorry…. I forgot that Hitler was a vegetarian who hated smoking. That must be it! LONG OVERDUE to mount a serious campaign to inform companies which advertise in the pages of Der Guardian that they will be BOYCOTTED for funding DISHONEST, BIASED, FALSE reporting in the Der Guardian. I’m FOR Boycotts. Boycott Sand Nazis ie.Fascist Iran and Eurotrash Nazis. Perhaps someone can leave a comment on the Guardian page explaining this. Oh wait, they can’t…. Absolute paranoid nonsense. There is no hint – explicit or implicit – of when the bombing took place. See also, ‘The ruins of the Second Temple, destroyed by the Romans’ [quite recently]. And more unhinged nonsense from Webber. For more context, the Guardian could explain that the airport was bombed along with the rest of Arafat’s multi-million dollar enclave as part of a response to the Sbarro, Dolphinarium, and Netanya Hotel bombings which were conducted in response to the 2000 peace offer Israel made to the Palestinians in accordance with Oslo and in the face of the people who opposed Rabin enough to kill him. But that’s just too much information for the general public to make their own assessments. Can’t have that! Does Arafarts beard wife Suha live in “paleswine” with her dear people? No Way Jose. She did live in Paris and Tunisia on her pension – but NOT with her people.